Stairway to … well, down. One end of a long tube. Dig this sink. I have been working on it for a long time. Today it arrived with enough shine to be used as a mirror as well as as a sink. The thing is, kitchen sinks in sailboats at sea never work. The whole concept of a hole in the middle breaks down when the boat is heeling. So water doesn’t run out. After a while the sink is filled with a disgusting slush of dishwater and food leftovers. For an inexperienced ocean sailor this makes it very tempting to skip doing dishes, especially if you are a little seasick. So the sink starts filling up with dirty dishes too. Which in turn contributes to a lower morale when it comes to keeping the salon tidy. Since I am designing a yacht made for comfort at sea in rough conditions, I had to do something about this, of course. 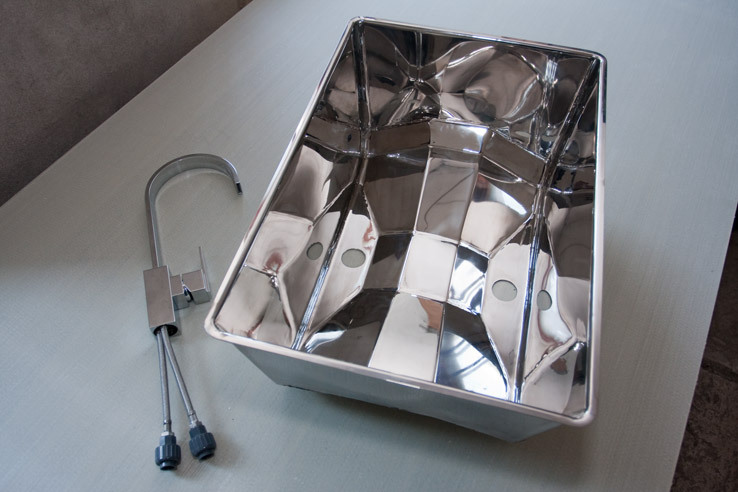 The complex bottom shape of this sink makes sure that all water will run out of the sink even at 25° of heel, and irrespective of pitching movement in waves. I asked several welders if they could manufacture it for me. Some just shook their heads and went away, but some said yes. It took quite a while, but I think the result was worth it. To complement the somewhat edgy look of the sink I choose a faucet with sharp angles as well. I don’t know the English name, but it is the mathematical situation of a local maxima AND a local minima in a two dimensional equation.